Edgar Albert Rattle was born in Yeovil in 1895, the son of railway porter Alfred Rattle (1864-1945) and Charlotte née Hull (1867-1946). In the 1901 census Alfred and Charlotte were listed living at 5 Lyde Terrace, Lyde Lane (today's Lyde Road) with their three children; Gertrude (b 1892), Gladys (b 1893) and five-year old Edgar. By the time of the 1911 census the family had moved to 51 Camborne Grove.. Alfred gave his occupation as a Railway Ticket Collector and 15-year old Edgar gave his as an Accountant's Clerk - he was employed by accountants and estate agents Fletcher & Bradford of Bank Chambers. He later started working in the Borough Accountant's Department of the Borough Council. Edgar enlisted in the Somerset Light Infantry (Service No 3436) at Taunton around 1915 but later (despite what the Western Gazette reported) his army records show that he was transferred to the Labour Corps (Service No 341806) and was working on a farm at Ilchester. In October 1918 Edgar visited Bournemouth while on leave but was suddenly taken seriously ill. He was hospitalised at Bournemouth Military Hospital where he died from pneumonia on 24 October 1918. He was aged just 24. 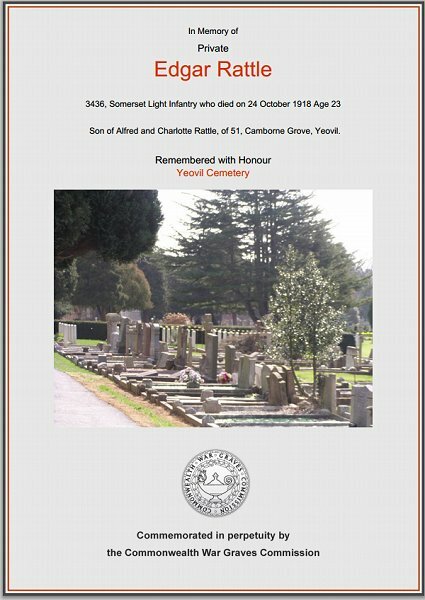 On 1 November 1918 the Western Gazette reported "The death took place at a Bournemouth Military Hospital on Thursday evening of Private Edgar Rattle, only son of Mr and Mrs Rattle, of 52 Camborne Grove, Yeovil, at the early age of 24 years. The deceased, who belonged to the Somersets, was previously attached to a Labour Battalion for some time, and had been working on a farm at Ilchester. He went to Bournemouth on furlough, when he was taken suddenly ill, and died from pneumonia as above stated. The late Private Rattle was well-known and highly respected in Yeovil, and the news of his untimely death was received with feelings of general regret and surprise by his many friends. Before joining the Army, about three years ago, he was in the Borough Accountant’s Office, and previously was employed by Messrs. Fletcher & Bradford, accountants (late Denman & Fletcher). The deepest sympathy is felt with the bereaved parents and other relatives in their sad bereavement." Edgar was buried in Yeovil Cemetery, Grave A3875, and his name is recorded on the War Memorial in the Borough. The Commonwealth War Graves Commission certificate in memory of Edgar Rattle.